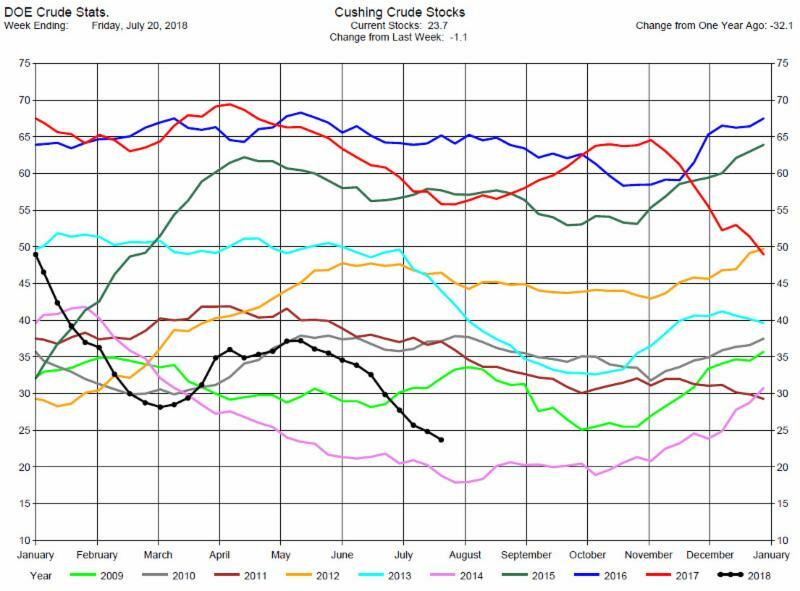 The DOE reported Total Crude Oil Inventories decreased by 6.1 million barrels to 404.9 million barrels for the week ending July 20, 2018, expectations average was for a 3.6 million barrel decrease, with a range of an 8 million barrel decrease to a 2.1 million barrel increase. 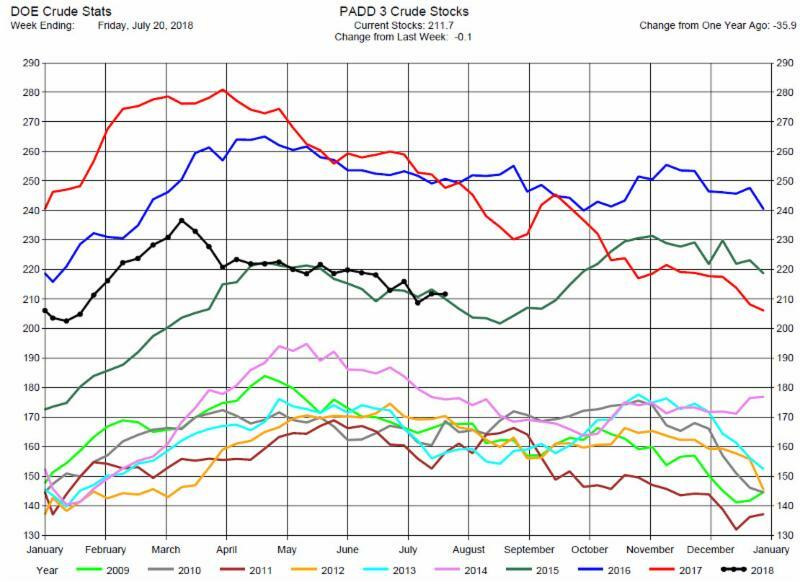 However, we note that the PADD 5 draw was 4.5 million barrels, so the PADDs 1-4 decrease was only 1.6 million barrels. 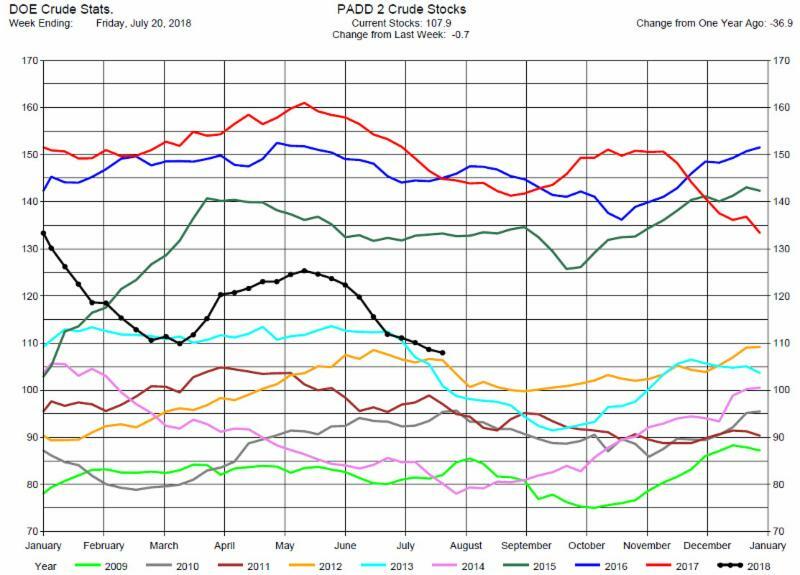 The market often discounts a large draw if the majority of the draw was in PADD 5, primarily California, which is often viewed as separate from the overall U. S. crude oil supply/demand. So the 6.1 million draw may not be viewed as overly bullish to price. 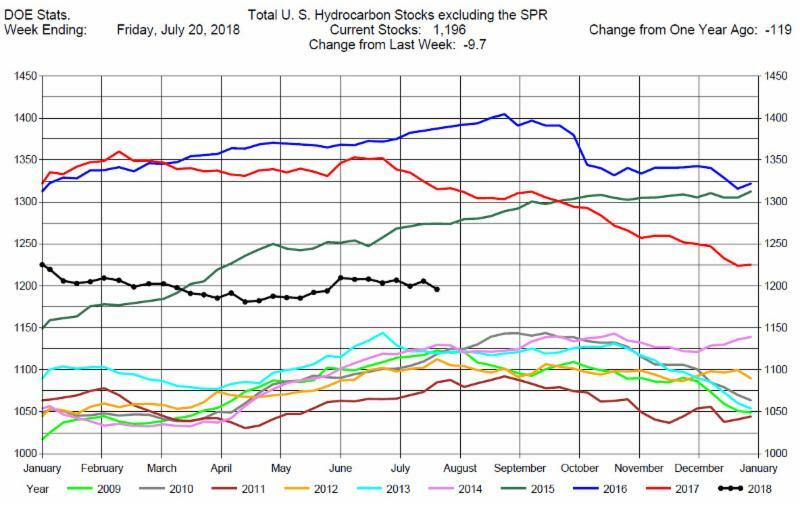 Overall hydrocarbon supplies decreased by 9.7 million barrels to 1,196 million barrels. 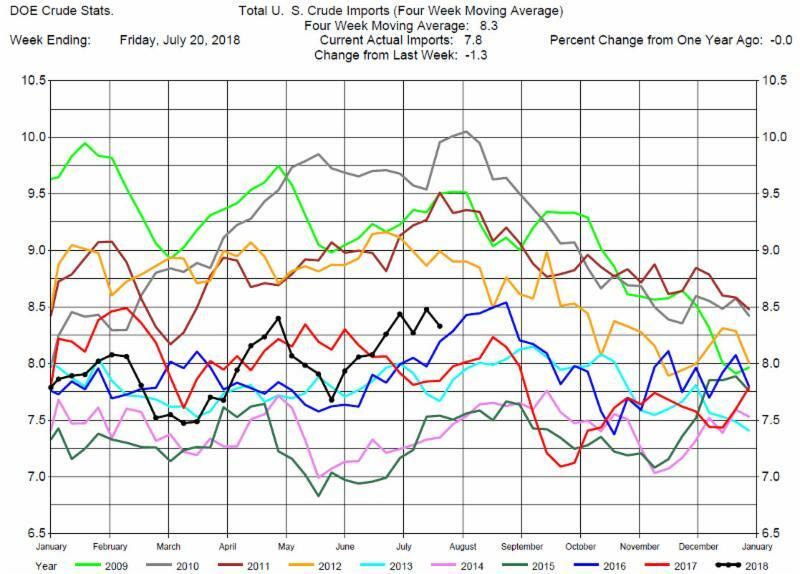 Total Crude Imports were down by 1.3 million barrels per day to 7.8 million barrels per day. 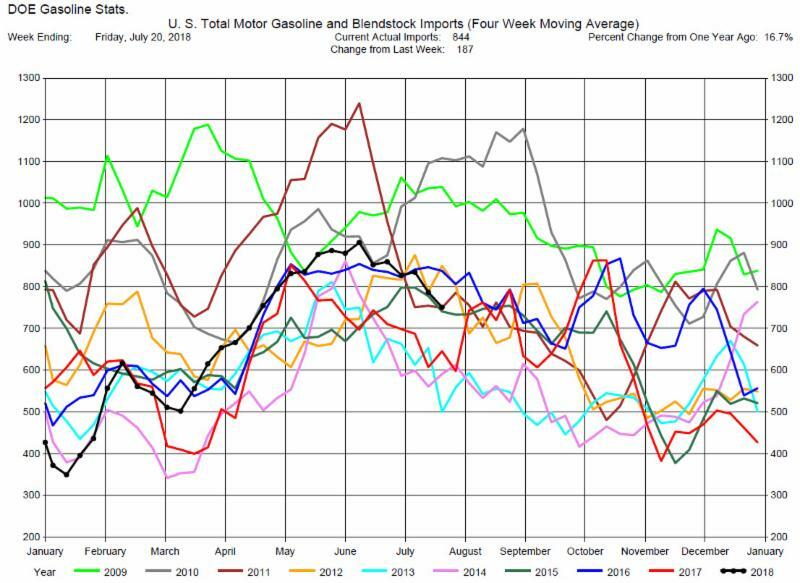 The drop in imports contributed to the Crude Oil Stocks draw. 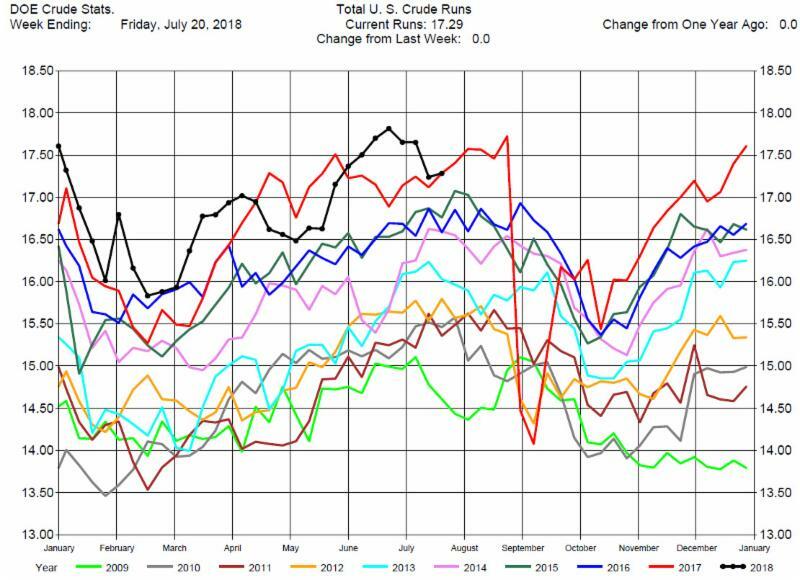 Total Refinery Crude Runs were basically unchanged at 17.29 million barrels per day. Crude Oil prices jumped 60 cents with the release of the DOE report. The market then dropped back during the next 20 minutes, but recovered. It traded to new highs, up $1 but fell by the end of the trading day, closing up 75 cents. For the near term the fundamentals are bullish to price. Venezuela crude oil production is at a 30 year low. 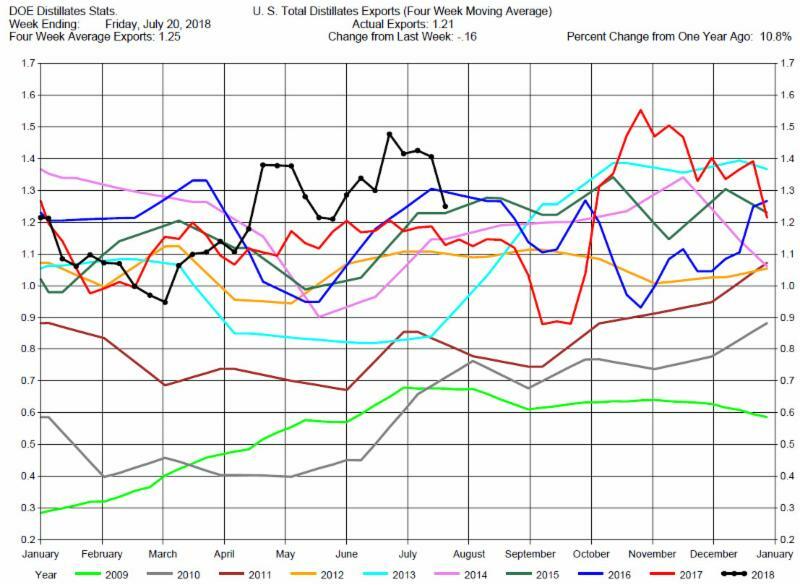 The OPEC and Russian output change have yet to be confirmed, And U. S. gasoline demand is at record high, requiring high crude oil run rates. We suggest consideration of being long Crude Oil Price Calendar Spreads as the upward price momentum continues. 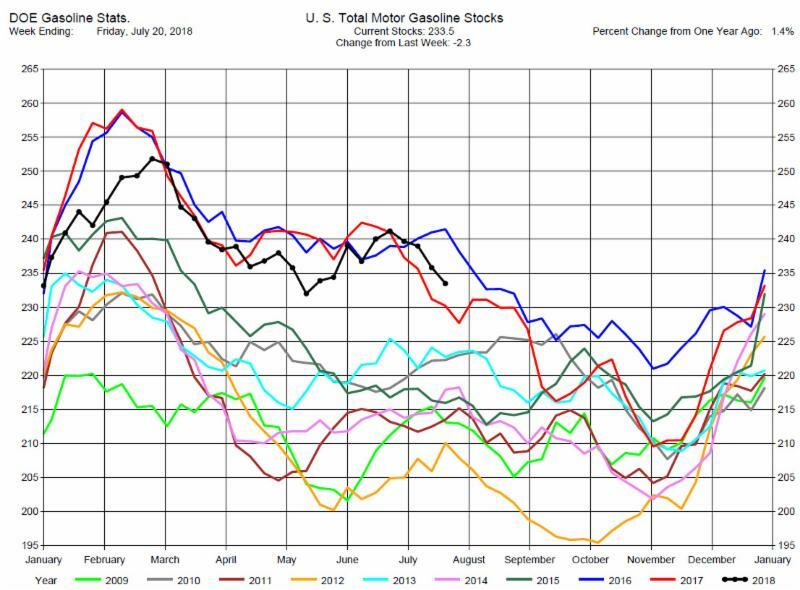 Total MotorGasoline Inventories decreased by 2.3 million barrels to 233.5 million barrels for the week ending July 20, 2018, expectations average was for an 800,000 barrel decrease, with a range of 2.2 barrel decrease to a .6 million barrel increase. Implied Demand was up by 120,000 barrels per day to 11.40 million barrels per day, a new record high. 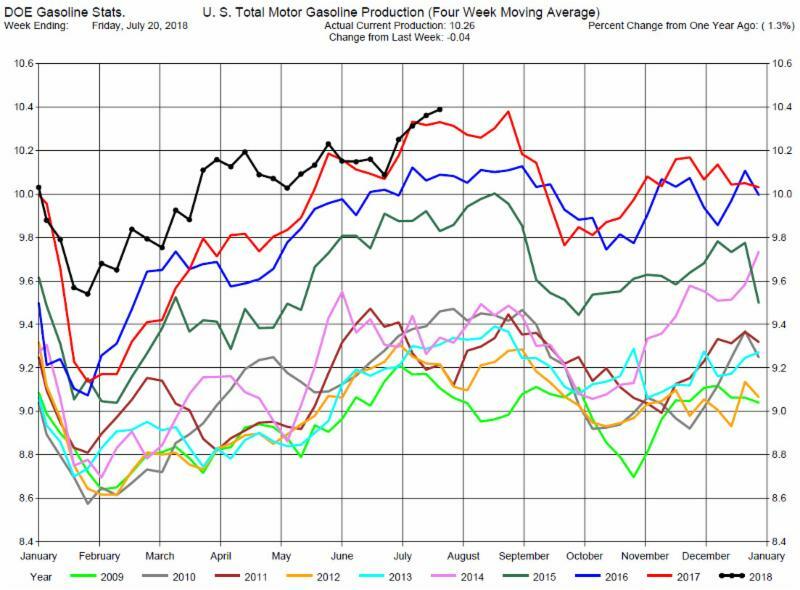 Gasoline Production was down by 40,000 barrels per day to 10.26 million barrels per day. 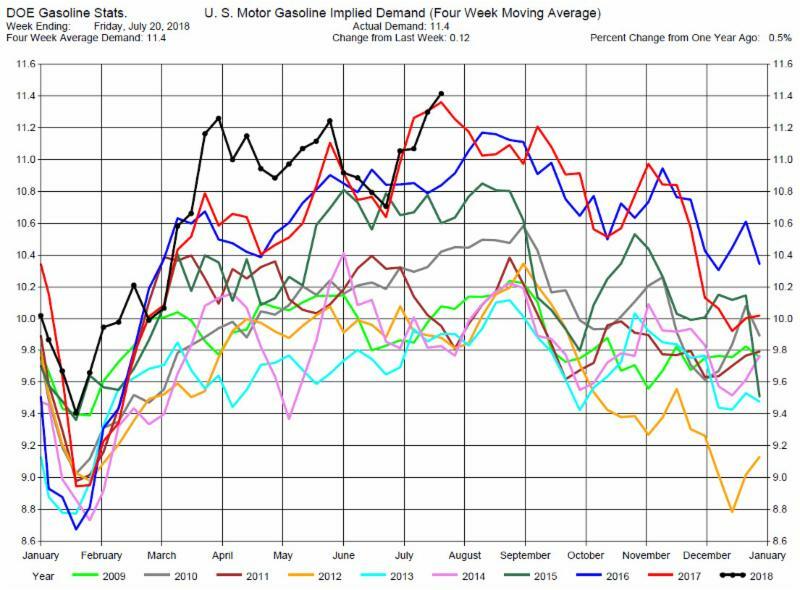 With Gasoline Inventories continuing their seasonal decline and Gasoline Demand at record levels, we view this as a bullish scenario for prices. Crack spreads and calendar spreads are improving so we suggest considering long positions in the cracks or calendar spreads. 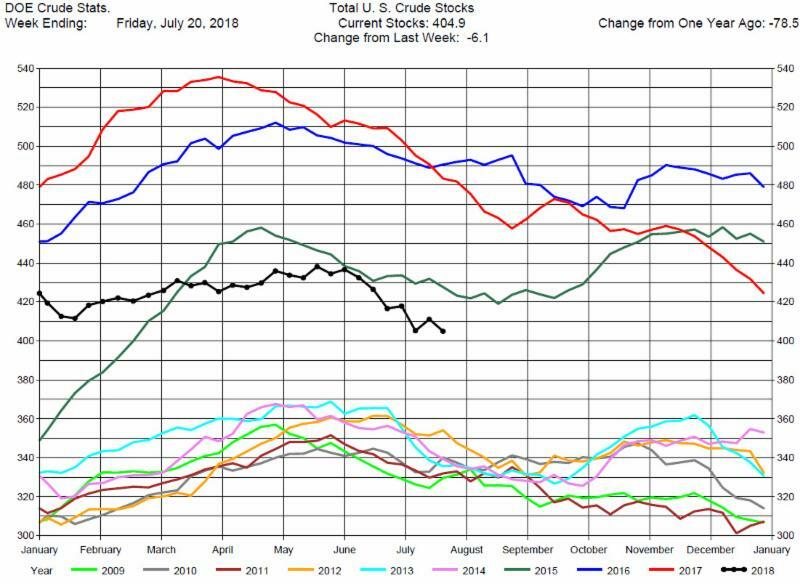 Total Distillates Stocks decreased by 100,000 barrels to 121.10 million barrels for the week ending July 20, 2018, expectations average was for an 800,000 barrel increase, with a range of a 900,000 barrel draw to a 2.1 million barrel build. 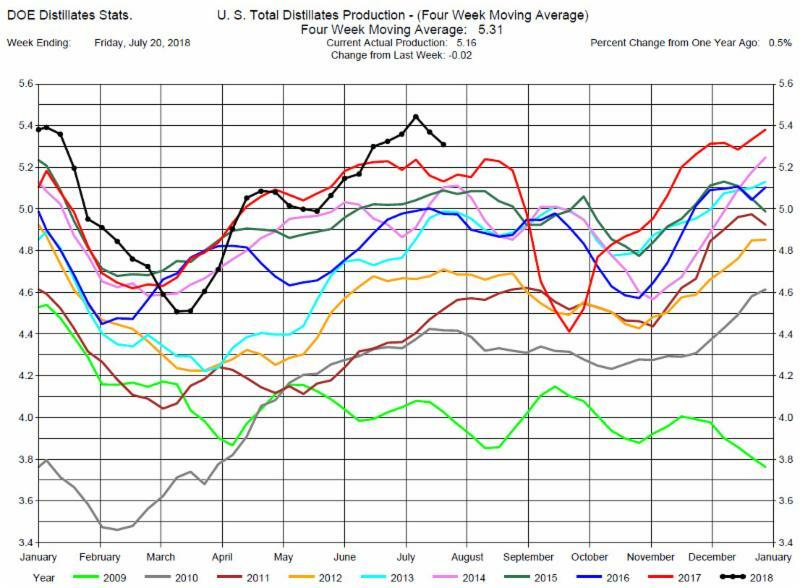 Total Distillates Production was down up by 20,000 barrels per day to 5.16 million barrels per day. Even with the decrease, Production remains at record levels. 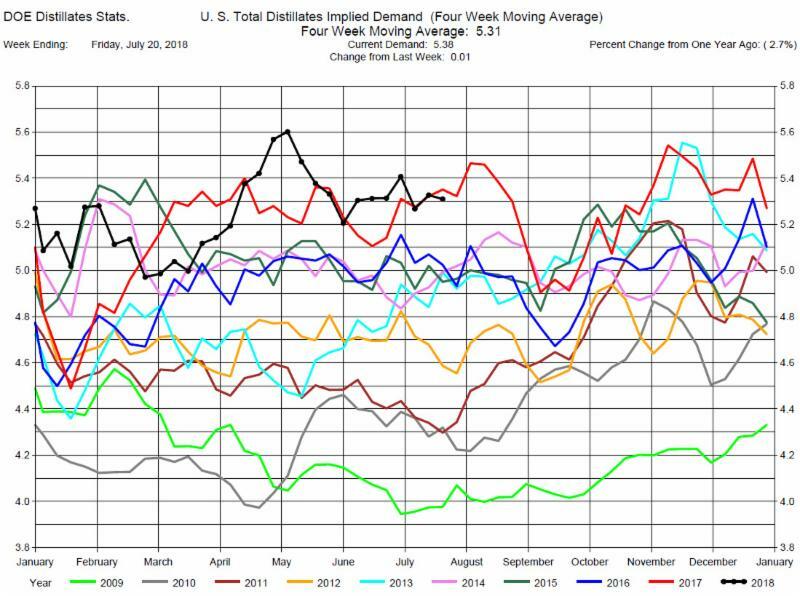 Total Distillates Implied Demand was up 10,000 barrels per day to 5.38 million barrels per day. 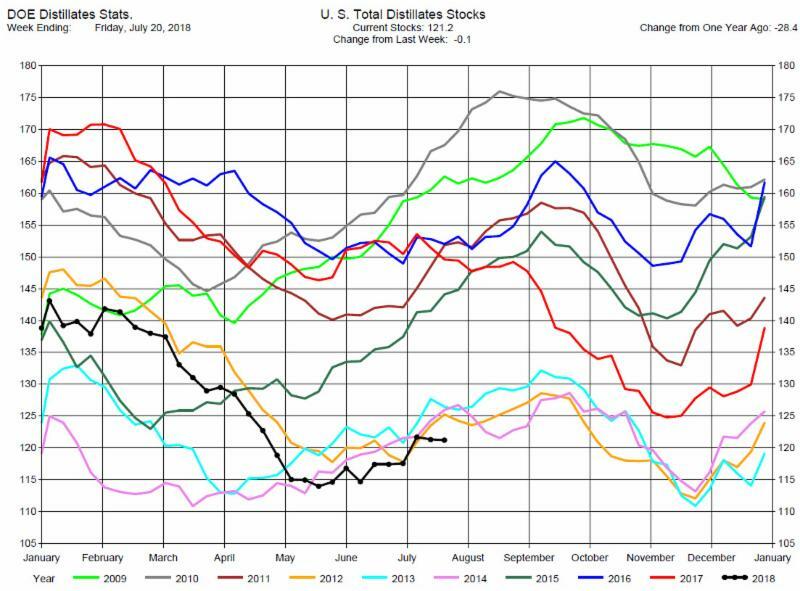 Distillates Demand has been strong enough to keep Distillates Stocks at record lows, despite record level Distillates Production. We view this as a bullish scenario and suggest traders consider Heating Oil cracks or calendar spreads as a bullish opportunity.